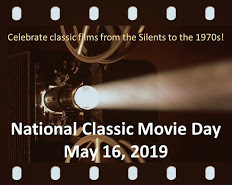 This post is part of the Children in Film Blogathon, hosted by the lovely and talented Comet Over Hollywood. It runs May 24-26, 2013. Billy Chapin (right) tells Lloyd Bridges what’s wrong with his swing. 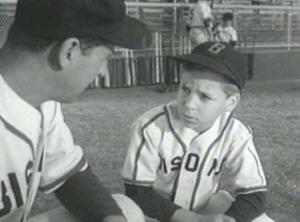 This is the type of kid Billy Chapin portrays in the 1953 comedy-drama, The Kid from Left Field. Chapin plays Christy Cooper, a nine year-old who gets a job as a bat boy for a losing major league baseball team. In an early scene, the team’s owner (Ray Collins) reveals his discouragement about the team’s record, and lets us know how bleak the situation is. Collins: Ty Cobb. There! There was a ball player. Chapin: No one’s ever gonna beat all the records that he set. Collins: Nobody in my ball club is, I’ll tell you that. Eventually, with the help of his father, Chapin begins to coach these hapless players. Okay, we can tell by the raspberry you’re blowing that you’re not buying the idea of a child coaching professional ball players. But this is exactly where Chapin’s performance makes the plot believable. Chapin wears a serious expression and has slightly sad, soulful eyes; when he says you’ve gotta choke up on the bat, you find yourself taking his advice. Chapin’s father/mentor (Dan Dailey) is a failed major leaguer who was sent down to the minors and never made a comeback. Even though he is relegated to selling peanuts, he is a brilliant baseball analyst. He easily identifies the team’s weaknesses and shares practical solutions with his son. Chapin and Dailey have a respectful, tender, father-son relationship. (The screenplay makes no mention of Chapin’s mother.) Dailey is a flawed but sympathetic character: he sometimes disappears in the evenings to drink at the bar, and he has a testy relationship with his boss. It pains us a little to see how much love Chapin displays for his father because it can’t be long before disillusionment whacks the poor kid in the gut. Chapin is a serious boy with a serious job. He doesn’t mug for the camera or do anything to draw undue attention to himself. He may not be the best child actor Hollywood has ever produced, but he has enough integrity to comfortably carry the movie. The movie loves to poke fun at Chapin’s age. In one scene, Chapin and the umpire get into a heated argument during a ball game. The umpire orders Chapin off the field and, when the lad refuses, the ump simply picks him up by the waistband and carries him off the field. The Kid from Left Field has a more complex script than many baseball movies. Lloyd Bridges plays an aging ballplayer who benefits from Chapin’s coaching. Anne Bancroft, in one of her earliest film roles, is the front office secretary in love with Bridges. And Richard Egan, in a Golden Globe-winning role, is superb as the slick manager who takes all the credit for the team’s winning streak. This film was remade in 1979 as a made-for-television movie starring Gary Coleman, and a similar story was produced again in 1994’s Little Big League. The 1953 version, however, is a thoughtful look at fathers and sons, forgiveness and missed opportunities. The Kid from Left Field is a warm, hopeful film that reminds us redemption comes in unlikely ways. Another review of The Kid from Left Field is available at Classicfilmboy’s Movie Paradise. The Kid from Left Field: starring Dan Dailey, Anne Bancroft, Billy Chapin. Directed by Harmon Jones. Written by Jack Sher. Twentieth Century-Fox, 1953, B&W, 80 mins. This is one of those movies that I have been meaning to see for years, and today I regret that I never did. I will be remedying this mistake at my first convenience thanks to you and this marvelous post. I have seen little of Billy Chaplin in the past, but what I have seen, I have enjoyed. Thanks for making this one jump up on my list. Besides, you can’t go wrong with a baseball movie! No, you certainly can’t go wrong with a baseball movie. Billy Chapin is really cute and believable in this role. The portrayal of the relationship between he and Dan Dailey is especially well done. Tis is the season for baseball. This was a pretty good film. My baseball movie essentials include: Pride Of The Yankees, The Natural, Angels In The Outfield, Eight Men Out, Bang The Drum Slowly, Major League, Field Of Dreams and Cobb. The new film just out on Jackie Robinson sounds good. I recently discovered an EG ROBINSON in a short baseball film called Big Leaguer. Hardly a great film but just fun to see EGR pick up a bat in one scene and tell the pitcher Richard Jaeckel, ” see if you can try and get it bt me.” Funny stuff. This is so weird – my husband & I watched “Big Leaguer” for the first time just last night! You’ve listed some great baseball movies – I’ve never seen “Eight Men Out”. Will have to find out more about it. I love Chapin in Night of the Hunter but hadn’t heard of this film. Thanks for bringing to my attention! Maybe I’m crazy but I Chapin reminds me of a little John Kerr. His performance sounds great in this movie! Thank you for participating and wonderful post! Billy Chapin is terrific in this movie, and he needs to be. Even though he’s surrounded by a grade-A cast, the movie literally revolves around him. Ah yes, it’s sad to read about their lives. Poor kids. Sometimes, when watching this movie, you just want to pick up Billy and give him a big hug. Billy Chapin is terrific with adult actors. He really can hold his own, as you`ve said. I hope you get the chance to see this movie. If you`re home sick one day, you can find it online on a bizarre Chinese-language website. I too haven’t seen (or indeed actually knew) about this film. Thanks for sharing it in such a wonderful post, I enjoyed reading it. Thanks for dropping by! 🙂 `The Kid from Left Field`is a feel-good movie that doesn`t push its unlikely premise too far. Yeah. Those old soul kids will get you every time. Don`t they, though. Billy Chapin, in this movie, is someone you feel very maternal towards, yet you`re glad the script didn`t resort to a cheesy storyline where the dad marries a new mother figure. I`m glad they had the courage to not do that. I had intended to watch and review this movie last month when I was doing baseball movies. Alas, I just didn’t get to it. You know…so many movies, so little time to watch them all. Then I read Classic Film Boy’s review and was kicking myself for not getting to it. Now, after reading your review, I’m doubly kicking myself. It sounds like a touching and completely charming film. I definitely want to see it! Patti, I’m surprised – with your excellent baseball movie reviews – that you hadn’t seen this. But I know how it is when spring arrives… Sometimes the weather it just too nice to be inside watching movies. I’d be interested to read your take on “The Kid from Left FIeld”. I have only seen billy in a few scenes from There is no business like show business, yet I have Night of the Hunter laying in my laptop for ages. This film here seems interesting, and Billy’s character sounds a little like I was as a child. Ooh – you have to see “The Night of the Hunter”. Very creepy and well done, and Billy is terrific in that role, too. Thanks for your review! I have to say that I did indeed groan a bit when I read the plot but your review makes me think I am going to give this one a try! Thanks for convincing me! Yes, give it a go. It is an improbable plot but the script handles it well. Also, Billy says his lines with such credibility you find you can’t not believe him. Ruth, you hit the nail on the head with your opening paragraph of your excellent THE KID FROM LEFT FIELD: “Some kids are born with old souls. You know these kids – they act in an oddly responsible manner and they look at you as though they feel a little sorry for you. (Which they probably do, who are we kidding. )” Many of my cousins were like that as kids, so I can relate! (On a related note, you might want to check out FOR HEAVEN’S SAKE, another comedy about old souls, but that’s a blog post for another time.) You can’t beat this cast, with wonderful young Billy Chapin and a supporting cast including Dan Dailey, Team Bartilucci fave Anne Bancroft, and Ray Collins, PERRY MASON’s Lt. Tragg himself! This is also reminding me that I really must work up all my courage to see NIGHT OF THE HUNTER; I’ve been avoiding it because films with kids in dire peril upset me no end. But I digress…I very much enjoyed your post, Ruth, as always! Hope you and yours have been having a great Memorial Day Weekend! Hey Dor, “The Night of the Hunter” may not be a good film for you to see. Although it is a fantastic film, there are some disturbing scenes in terms of the kids’ danger. I will check out “For Heaven’s Sake”. Sounds like one I’d enjoy! Oh I have to see this! I love your description of Billy Chapin’s “old soul” 🙂 I can’t wait to get a hold of a copy of this. Thanks! You and Aurora are making my day with these “kid” posts. I love this blogathon idea. Yes, there have been some great posts for the Kid Blogathon. I think we should all do it again next year! Hey there! I nominated you for the Liebster Award! I think you already have this one so just consider this a friendly “Hello” and don’t worry about the requirements. Just watched Ronald Reagan and Doris Day in The Winning Team. It is based on the great baseball pitcher Grover Cleveland Alexander. It was a very enjoyable film to me minus the 20 minutes that occur right after the hour mark. During this span of the movie Alexander goes into a drunken binge. Overall a nice baseball film to watch during the Summer or any time. “The Winning Team” sounds like an interesting movie. I don’t really know much about Grover Cleveland Alexander. Thanks for recommending!